The University of Alabama at Birmingham – Paul F. Castellanos, M.D. Mayo Clinic Scottsdale – David G. Lott, M.D. University of California Los Angeles – Dinesh Chhetri, M.D. University of California San Diego – Philip Weissbrod, M.D. University of California San Francisco – Mark Courey, M.D. University of Colorado Denver – Matthew S. Clary, M.D. Emory University Atlanta – Jeanne Hatcher, M.D. Georgia Regents University – Paul Weinberger, M.D. University of Iowa Iowa City- Henry Hoffman, M.D. Louisiana State University Baton Rouge – Andrew J. McWhorter, M.D. 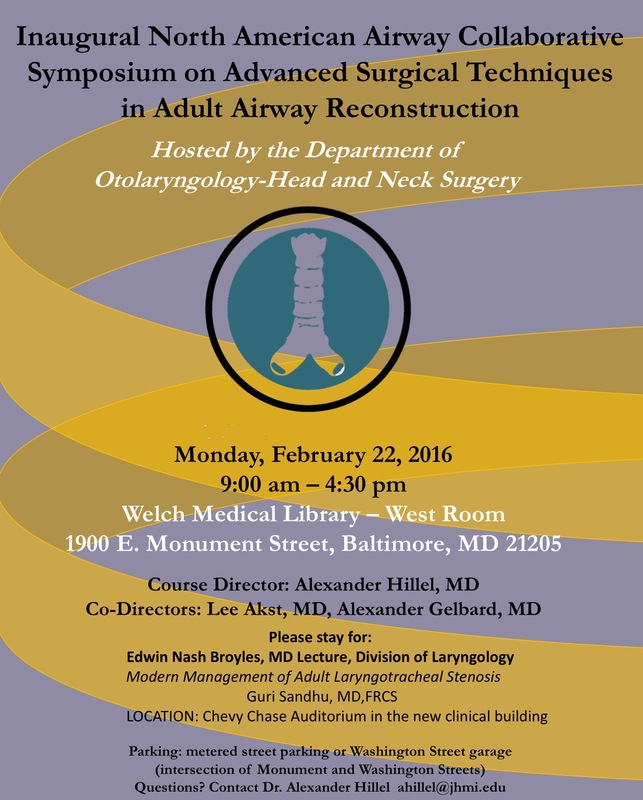 Johns Hopkins Baltimore – Alexander T. Hillel, M.D. Massachusetts Eye and Ear Infirmary – Ramon Franco, M.D. University of Michigan – Robbi Kupfer, M.D. University of Minnesota -Stephanie N. Misono, M.D., M.P.H. Mayo Clinic Rochester, – Jan L. Kasperbauer, M.D. University of Nebraska – Christopher M. Bingcang, M.D. University of North Carolina – Rupali N. Shah, M.D. Duke University – Seth Cohen, M.D., M.P.H. Cleveland Clinic – Paul C. Bryson, M.D. Oregon Health & Science University – Joshua S. Schindler, M.D. Vanderbilt University Medical Center -Alexander Gelbard, M.D. University of Texas Southwestern – Ted Mau, M.D., Ph.D.
Baylor College of Medicine – Julina Ongkasuwan, M.D. University of Utah – Marshal E. Smith, M.D. University of Virginia – James J. Daniero, M.D., M.S. University of Washington – Albert Merati, M.D. University of Wisconsin – Seth H. Dailey, M.D. University of Sydney – David Veivers, M.D. Charing Cross Hospital, Imperial College London – Guri Sandhu, M.D.